The Cobblers have boosted their attacking options with the dramatic last-minute deadline day swoop for Burton Albion striker Marvin Sordell. With just minutes remaining before the 11pm deadline for the January transfer window, Town sealed the loan signing of the former Bolton Wanderers, Burnley and Coventry City man. But they cut it fine. After a day of wheeling and dealing and negotiating with a string of clubs and players, Sordell arrived at the PTS Academy Stadium at 10.45pm to sign the paperwork, and agree to join the Cobblers. Sordell has been at Burton since the summer of 2017, but the 27-year-old hasn't played for Nigel Clough's men since early November and now joins Town on loan for the rest of the campaign. He becomes the fifth loan signing that manager Keith Curle has made since the turn of the year, joining George Cox, Joe Powell, Timi Elsnik and today's other deadline say signing, Charlie Goode. 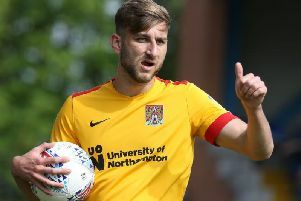 It means the Cobblers boss has yet to make a permanent signing since taking over from Dean Austin at the beginning of October. Sordell began his career at Watford, where he enjoyed the most prolific scoring spell of his career, netting 27 goals in 58 starts as 23 substitute appearances. That form earned him a £3m move to Bolton Wanderers, but he couldn't establish himself in the north west, and after a loan spell with Charlton, he joined Burnley before spending a season apiece in league one with Colchester united and then Coventry. He joined Burton in 2017 and has made 62 starts and 22 substitute appearances for he Brewers, netting a modest nine goals. But it is talent for leading the attacking line that is of most interest to Cobblers boss Curle, who earlier this week bemoaned the fact Town didn't have a reliable focal point to their attack. "Marvin is an experienced striker and just the sort of player we were looking to add to the squad," said Curle. "He is a good age, he has a fantastic pedigree having played a lot of football at Championship level, he has good quality, his movement is excellent and he has shown throughout his career he can score goals at every level. "We are delighted to have been able to bring someone of Marvin's calibre to the club and we are looking forward to working with him." In his career, Sordell has netted 67 goals in 214 starts and 94 substitute appearances, but this will be the first time he has played in league two. The signing of Sordell completed the Cobblers' January transfer window business, which saw five players coming in, and six leaving. Leaving the club were Kevin van Veen, Matt Crooks, Yaser Kasim, Lewis Ward, Billy Waters (loan) and Hakeem Odoffin, while the signings have been Cox, Powell, Elsnik, Goode and Sordell.